This is the third (and final) in a series on maintenance and care of your Drive. The Mirage drive is a pretty rugged piece of gear and doesn't require much. Still, like any piece of equipment, if you only use it and abuse it, sooner or later you're going to lose the use of it -- and it will undoubtedly happen at the worst possible moment. 1. 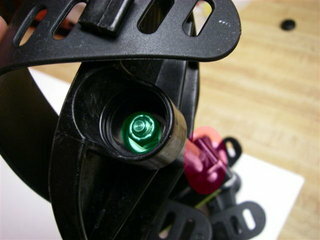 Rear sprocket guard/outhaul rotates freely (right highlight below). If you have Turbo or ST fins, check the position -- make sure the adjustment screw is not backing out (just look at the fin position; make sure it hasn't moved. 2. If you have the new or recent drive (with plastic sprockets), check your (fin) mast retaining screw (an Allen head screw located just above left highlight, above). It should be snug. If the mast needs no adjustment (see next sentence), you should probably just leave it alone. There should be no twist or wobble in your mast. Look closely at the mast interface with its mounting surface (highlight below). If you see any signs of wear or gap developing, replace your sprocket assembly now, before the mast falls out later. If you have an older drive with stainless steel sprockets, inspect your cotter pins -- make sure they are intact. If your mast wobbles in its housing, don't worry -- that's normal (this does not apply to plastic sprockets!!). While you're at it, inspect your cotter pin holding your sprocket shaft. 3. 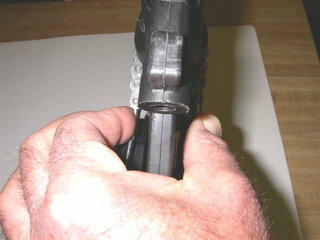 Cables: Starting with your idler cable, squeeze it about mid length (see below). If it doesn't move, it's probably too tight. it should give slightly (about 1/8 inch). We'll discuss adjustment momentarily. Next, squeeze your chain cables in the same manner. The front should have a little give (again, about 1/8 inch), and the rear, slightly more (3/16 inch). These measurements are more critical if you have the stainless sprocket -- too loose and you can skip a cog on the sprocket; less critical with plastic sprockets. In order to adjust your cables, you'll need a 7/16 open end wrench (or equivalent) and needle nose vice grips (preferred). Find the ends of the cable you want to adjust and note the swedge (crimped area at end of the cable) and nut (examples below). 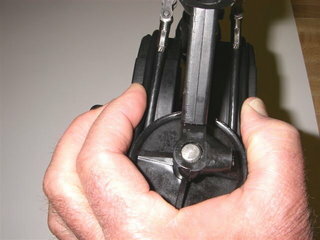 Simply tighten or loosen the nut while keeping the cable swedge from twisting (that's the only hard part). Do this in the following order: 1) idler pulley; 2) front cable; 3) rear cable. You should work both left and right sides a little at a time so your fin mast doesn't start to get off center. Squeeze the cable as you go. Recheck everything when done. Not nearly as difficult as it sounds, this is pretty fast and easy once you get the hang of it. 4. Inspect all six swedges. Make sure there is no fraying or any signs of looseness between the cable and swedge. 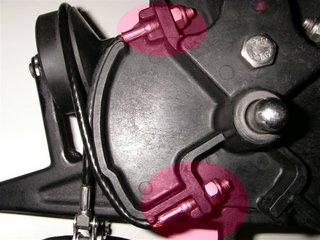 If appropriate, check the cotter pin (green circle below) on your idler pulley to made sure it has no broken ends. 5. 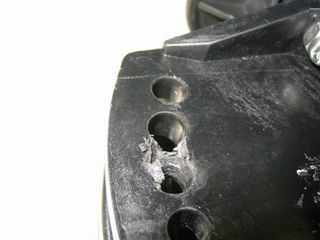 Now look at your pedal arm adjustment holes, especially if you have Turbofins. Make sure there is no heaving or strain marks on your holes. This can be an early sign of pending drum hole failure. This is not critical (because you can always find a good hole in an emergency) but I recommend ordering a replacement at the earliest sign of excessive strain. In the picture below, this hole has already failed. 6. Moving up to the top, check your pedals. 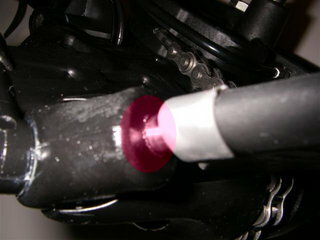 the shaft should not wobble and the pedals should be within 1/16 inch of the post. If there is shaft wobble, you'll need to order a new crank arm (comes with pedal shaft) immediately. If you have excessive pedal gap, pop the end cap and tighten accordingly. 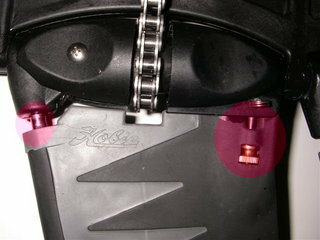 If you have the older screw in pedals, Hobie no longer stocks pedals, but you can still get the crank arms if you need them. Standard bicycle pedals (left and right thread) will work if you need any maintenance. Look for stainless or anodized if possible. Almost done. Take an overall look at the Drive and make sure nothing is loose or falling off. Operate it; it should move freely with minimal effort, not binding and not sounding gritty (if so, trouble shoot the problem and correct). Note if your drive is new, it may feel a little stiff. That's normal. BUT, if it seems overly stiff, you might want to make an adjustment (see # 3 above). That's all I can think of. Sorry for the length, but I have tried to make this comprehensive. The Mirage Drive is a very reliable unit, even when not regularly maintained. Yet, as you read on these topics, failures do happen. IMO, at least 90% of these can be prevented by regular inspection and maintenance. Just remember to bring your paddle just in case! PS None of this is official Hobie procedure. Always consult your owners manual if in doubt. I hate to have to say this, but be sure not to spill any hot coffee in your lap either!